The world looks much different from fifty days ago. Lots of big things have happened. We celebrated the holidays, ushered in a new year, and sat glued to twitter as we watched the tumultuous transition of our world into this terrifying new post-Brangelina era! I’m still a little bit numb from that. I think someone closed a sale on some historic house, and oh, we launched the early access version of Astroneer. Right. You’re probably wondering how that went. 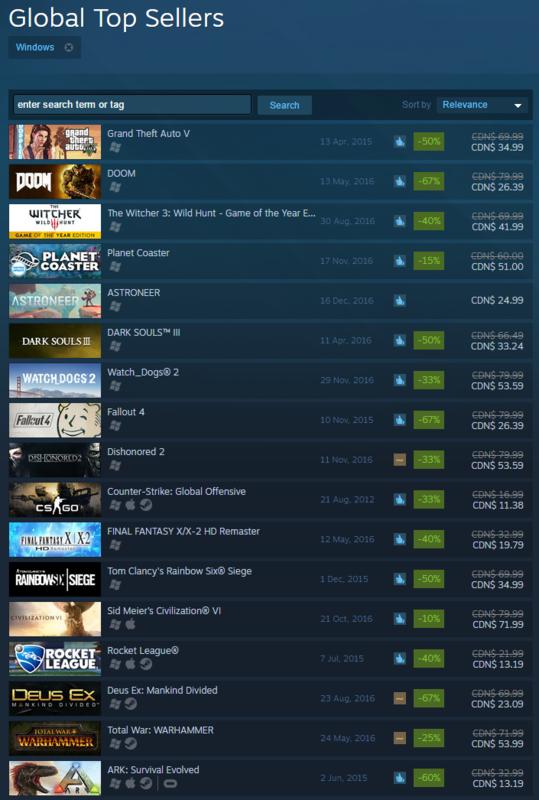 Steam Winter Sale 2016 blew our collective minds. I don’t think it can be overstated how taken aback we were by the reception the game got. One day, I’d like to do a postmortem breaking down regional and temporal sales data with cool visualizations like other game companies do, but for now I’ll have to just state what amazes me most, which is the number of hours played so far. We don’t have an exact number because we don’t have precise metrics for Xbox, but suffice to say it’s more than 5. Million. Well north of five million hours of Astroneer has been played in the last month and a half. 655 years of game time. Wat. Watching dozens of simultaneous gameplay streams at once was a surreal experience that I’ll never forget. We love watching this new community play and laugh together while making discoveries or exposing glitches. And let me say, way to go for doing some things that we hadn’t even considered. Building your babel-towers all the way up to the launch satellite? I don’t care if you broke the game, that deserves applause. That isn’t to say it was the smoothest launch on the books. We had more than our fair share of troubles in the first week, and all of my personal time between the time I pushed the button to release the game to about Christmas was spent tackling various show-stopping bugs as reports poured in. We learned a hard lesson about getting extensive hardware compatibility testing done, as we had several issues that affected people with certain CPU architectures. We were fortunate to be able to correct most of those within the first day, and the rest within the first week. We had, and still have, plenty of crash bugs, gameplay glitches, and a slew of pathological performance issues. The most common of these, especially focused on corrupted save game issues, were fixed by the new year, but many problems remain. Some of them we detailed in a recent live stream. I hear you. Everything is coming. The steady weekly patch cadence is coming, and the big content updates are coming. The bugs will be fixed. Performance will be improved. The support the game has received has given us a mandate – an obligation – to build this into the best game we can possibly make. It’s just that from a development perspective, January was the slowest month we’ve ever had and are likely to ever have. I predict that February will be the second slowest. The reason is paradoxical: We have had to slow down now to speed up later. Part of this was just requiring time to recharge. Each of us took at least a little extra time to be with family or mentally recuperate following the sprint to launch and the crunch of post-launch support. The second aspect is growth, both in size and maturity as a company. At launch we were six full time developers. We expected that we might sell enough to slowly expand to perhaps 10 over the following year. We now aim to be around 15 people by next winter, and to grow much more quickly than anticipated. To achieve this, we had to quickly find and secure a new office location, and I’m pleased to say that we were able to do this and take possession in a little over a month, which is no mean feat. A proper office space carries a slew of overhead and paperwork to take care of, which we were not fully prepared for. Nor were we exactly prepared for, you know, making money. I’m just emerging from a figurative business management crash course as over the last month I’ve been working to ensure that all of our legal and accounting ducks are in a row to handle things like taxes, employee payroll and benefits, and all our licensing and insurance requirements, not to mention handling the small army of people who seem to emerge from the woodwork waving proposals for business partnerships in your face once you have a successful product on the market. I’m not exactly sure how to classify our administrative state last year, but we are definitely now a tidy company, ready for expansion. A couple of us checking out our new office before the official move-in. That’s me on the left. To that end, we’ve also been very busy on the HR front, opening a set of new positions and interviewing fairly steadily. I’m happy to say we’ve made our first full time hire, and we’ll have more on that soon, but the point of saying these things is that all of this hiring and business-ing has taken a ton of time away from actual game development. That part has made me sad, but the result will be that months from now, we will be a much more capable studio, able to handle a much larger load. Almost overnight, we found ourselves with a community larger than we ever thought we’d have, and so we’ve been doing our best to become the company that community deserves to support them. The good news is that most of the business overhead work is dying down. In February we’ll be moving into the new space, and all the while cranking on content for our first named update. Paul and Adam have been cranking out some great new art, Riley is filling in gaps in our sound effects, Jacob is refining some brand new mechanics, and Zabir has been hard at work on certain optimizations, with me finally getting back into the technical side as well, and by the end of February I’m hopeful we’ll have gone from 6 to 9 people, and then the pace will start to really accelerate. I promise, we’re just getting started. Thank you for playing, and keep your channels open as we share more about this journey we’ve just embarked on with you. Astroneer Nominated for 5 Webbys! Vote now! Astroneer 1.0 Launches On February 6th 2019! Astroneer & System Era at GDC 18!